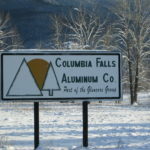 The aluminum smelter at Columbia Falls, Montana, was built by the Anaconda Company and went into operation in 1955. Anaconda, a huge global mining company, was the fourth company to become an aluminum producer in the U.S.
After a rocky start in the 1950s, the plant expanded from two potlines to five during a robust economy in the 1960s. 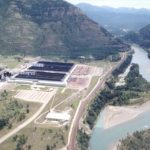 However, the additional pot rooms, inadequate emission control equipment and the proximity to Glacier National Park led to a crisis as local residents and the federal government filed air pollution lawsuits against Anaconda. 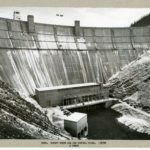 An expensive technological fix to the pollution problem was found and completed under new ownership by the Atlantic Richfield Company, but rising power costs and poor markets presented new hurdles. When ARCO decided to get out of the metals business, the smelter was acquired by Brack Duker and Jerome Broussard, who ran the smelter as a tolling plant and promised to share profits 50-50 with the employees. When the owners ceased to meet their profit-sharing obligation, an historical lawsuit ensued and a new owner took over – the Swiss-based commodities giant Glencore. Power prices and market conditions continued to plague the plant, and it finally shut down in 2009. Several years later, the plant site was placed on the federal Superfund’s National Priority List for cleanup. Aluminum is commonly found in the Earth’s crust, making up 8% of the lithosphere by weight, but unlike gold and copper it is never found in metallic form as nuggets or in ores that were smelted by ancient civilizations. 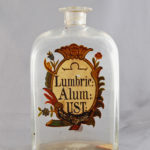 The hidden metal was bound up in compounds that ranged from gems to clays. Aluminum uses during the First World War were confined to dog tags, mess kits and canteens, even though the U.S. government took 90% of Alcoa’s output. By the time the world was engulfed in war a second time, modern all-metal aircraft were commonplace and strategists understood the significance of aluminum to winning the war. The U.S. war effort benefited from geographical isolation and abundant power resources, but the build-up was slow to get started. The 1950s saw the consolidation of the Big 3 aluminum companies in the U.S. and the introduction of new producers in the Pacific Northwest, Ohio River Valley and Gulf Coast. The Korean War defense effort assisted this development with government loans and stockpile purchases. Meanwhile, new and growing aluminum uses promoted market growth until supply outstripped demand in the recession that closed the decade. The U.S. aluminum industry’s expansion in the 1950s and 1960s paralleled the economy’s growth. As the new player in the industry, the Anaconda Aluminum Co. began by expanding downstream by building or acquiring fabrication plants in the 1950s. That was followed up by investments in bauxite and alumina resources during the 1960s. The company declared itself vertically integrated in 1973. 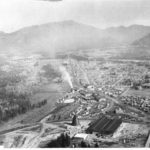 By the 1960s, Columbia Falls faced point and nonpoint air pollution sources – timber plants and the aluminum smelter on the one hand, and garbage burning and dusty streets on the other hand. 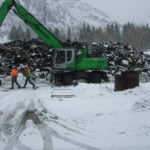 Controlling air pollution was costly for industry, which needed to purchase expensive equipment and keep it maintained, and for government, which had to find a new way to handle garbage, monitor burning across the Flathead Valley and pay for paving streets. ARCO was initially seen as a white knight that saved the Columbia Falls aluminum plant when the Anaconda Company was on the skids. The two investors who took over the plant from ARCO in 1985 were viewed the same way – at least in the first few years, when profit-sharing was a good tradeoff for pay-and-benefit cuts. Then the two owners began to withhold profit-sharing from its employees, which hurt relations with tolling customers, affected employee morale and led to an historical lawsuit and legal settlement. When the dust settled from the profit-sharing case, another white knight appeared at the plant gates – Glencore, one of the largest commodities-trading companies in the world, bought the Columbia Falls smelter in May 1999. The aluminum plant had at least one good full year of production under Swiss ownership before it was taken down by a power market deregulation scheme that resulted in power prices increasing by 2,000% or more. 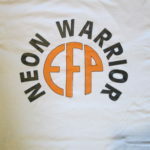 In the end, the plant joined eight other Pacific Northwest aluminum smelters that never recovered from the West Coast Energy Crisis. Industrial sites almost always require expensive cleanups after closure. The reckless dumping of spent potliner, wet scrubber sludge and other hazardous materials at the Columbia Falls aluminum plant during its first three decades of operation pretty much guaranteed that the property would become a Superfund cleanup project. 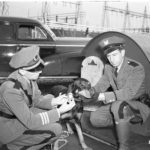 Resistance to that designation, however, came from past company managers, local county officials and a lone congressman.